Want a Thorne bros. rod and good reel. I fish in a permanent 90% of the time like shorter type rods. Pan fish and Walleyes.. any good "universal" rod they carry or is it a two rod cost ?? it's gonna be tough to find a rod that you can fish well for both species with, last year i started to get into bull gills a little and after the first trip i realized just how frustrating it can be fishing for gills with a walleye rod. and i didn't try for them again til i had a gill rod. i got the panfish sweetheart from thorne bros. it was definately worth the extra $ IMO. i really like the genz rods from berkley for walleyes, they are priced right and have been very very good to me. they are a very versitile action as well. i pulled a 35inch pike through the ice on 4lb test with the genz no problem. i like tica reels........smooth little buggers!. continueous anti-reverse is a must for the dabble! 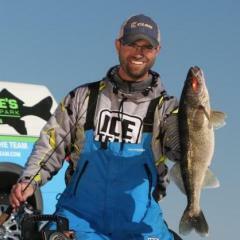 I agree with joshb, you're going to find it hard to fish effectively for both crappies and walleyes with the same rod. Somedays you have light biting crappies and need a sensitive tip, and than you are going to have those days when you hook into those hard fighting walleyes and you are going to want some backbone. I have used medium-light rods for both crappies and walleyes in the past. The Walleye Sweetheart is a very nice rod, same with the Professional for walleyes. For crappies I would go with either the Panfish Sweetheart or the Sweet Thing, both are phenomenal ice fishing rods. Location: A van, down by the river. Frabill combo's offer some options you should find fit the bill. The Frabill SenSive-XL Rod/reel combos are high on my list, and see a lot of use. The reels do not freeze up due to the SUB-ZERO LUBE Incorporated into the reels. They spool light mono's and superbraids like Power Pro's 8/1 up easily even in -0 temps. The per unit combo price is very doable and reasonable. I have paid far more for just the reel then a whole Frabill ice combo. Frabill also has a new nifty ice rod case out for 2004, the Pack-A-Pole Ice Rod Cases. I have one on order right now. I use the big Bro to the mew ice rod case, the Pack-A-Pole Rod Case and man it is one tough and convenient case. You could drive a Hummer over that baby and your gear would be just fine. It is very flexible in it's use, it can be extended or contracted to accommodate whatever rod lengths and configurations you need to pack. Plus..it has tackle and reel storage built into it. Very Cool! Just a few of the many new cool items out this season. Some well worth looking at when shopping for those new ice tools. LOL Tahoe. What did you do with dad's $40? I completely agree with the two rods. However, it is possible to pull up walleye on an ultra-light. Last winter while fishin' for gills, the bite stopped, and next thing you know the ultra-light is bent in half. My partner (which owned all the rods) reeled it in. Weighed about 4 lbs. What a fight though! So I have no excuses now I guess. Lucky you. Any time I tried to get something from my dad, he'd say, "go make some money and buy one for yourself". You want one like this he says.. you buy one like this. I have one of his hand me downs from two years ago. plus I do get his nice one to camp in just about anytime I ask so he a pretty cool old man ! !